Farnborough Hill’s mission to ‘educate the whole person’ ensures that music and drama are an important and integral part of school life. Music can be heard in every corner of Farnborough Hill and is celebrated with great joy and enthusiasm. Curricular Music and Music Technology are taught throughout the school and both subjects are offered at A level. Fifteen extra-curricular groups, including Orchestra, Choirs, Sixth Form Close Harmony Group, Swing Band, Recorder Consort, Flute Choir, Wind Band, String Group, Technology Club, and Jazz Quartet indicate the breadth and variety of music on offer. These, together with our stunning new £1.2 million music suite completed in April 2014, enable hundreds of girls to participate and contribute to the musical life of the school. Our choirs and instrumental groups follow a busy programme of performances and workshops for the school and wider community. Every year the Choral Concert in the Chapel brings together a choir of our students with friends and family. Diverse works have been performed including Rutter’s Mass of the Children, Chilcott’s Jazz Mass and the Mozart Requiem. The Christmas Season begins with the beautiful candlelit Advent Carol Service and, in contrast, the quirky Christmas Celebration encapsulates a range of moods. Throughout the year Musical Soirées are held so that every musician can have the opportunity to perform. The Senior Choir has produced several CDs and are preparing for the biennial European Tour in July 2015. Farnborough Hill has a longstanding tradition of excellence in the dramatic arts and vibrant drama productions are a feature of the school. All year groups study drama and many take it to GCSE and A Level. It is also offered in the form of specialised lessons where students are prepared for graded Trinity examinations in acting, speech and performance arts. There are many opportunities for the girls to participate in theatrical performances, not only acting and directing but also in the technical and design areas in the fully-equipped ‘Theatre on the Hill’. The high point of the year is the annual whole school production which is a great opportunity for students throughout the school to take part in exciting drama performances. Most recently the hill was alive with ‘The Sound of Music’! It was clear from the delighted reaction and tumultuous applause from the sell-out audiences that this production was something special. Next March the school will perform a piece of community theatre based on the Land Girls of World War II. If you would like to find out more about Farnborough Hill our next Open Afternoon is on 31 January: please call Clare Duffin on 01252 529811 to book a place. Music plays an active part at Parkside School. In September this year, Parkside School welcomed new Head, Mark Beach. Mark brings a wealth of experience, having successfully headed the Junior School at City of London Freemen’s School for the past 41⁄2 years and 7 years at Longacre School prior to that. There is a new vibrant atmosphere running through Parkside and this includes all the exciting opportunities available through the Music and Drama departments. Music plays an active part at Parkside School. It’s just as exciting to play saxophone, clarinet and other instruments as it is to play football or hockey. Boys have many opportunities to develop their musical talent and performance ability both inside school and at external events. Among the venues Parkside’s musicians have performed at recently are Dorking Halls, Epsom Playhouse and Guildford Cathedral. As well as more than a third of boys learning to play a musical instrument there are also good opportunities for boys to perform in groups; Big Band, Jazz Orchestra, Choir and Saxophone/Clarinet groups to name a few. 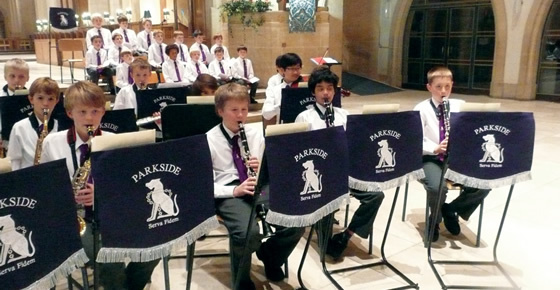 Parkside boys enter music exams such as ABRSM and Rock School. A number of boys are awarded Music Scholarships each year. The annual ‘Raise a Smile’ charity concert is an excellent opportunity to showcase Parkside’s talented musicians across the board. It is held in our own Performance Hall and all money raised is donated to a range of charities. Our Music Technology Suite enhances learning in this important subject and as well as being a very dynamic and enjoyable aspect to the school week music helps to support many other aspects of the curriculum and develop confidence. Speech and Drama at Parkside is also integral to the curriculum with boys involved in weekly drama lessons and many taking part in school productions. Parkside actively encourages keen pupils towards scholarships by encouraging and nurturing their talent. The Speech and Drama Department at Parkside maintains an ethos of being all-inclusive but at the same time having high expectations of the pupils and offering them exciting challenges. 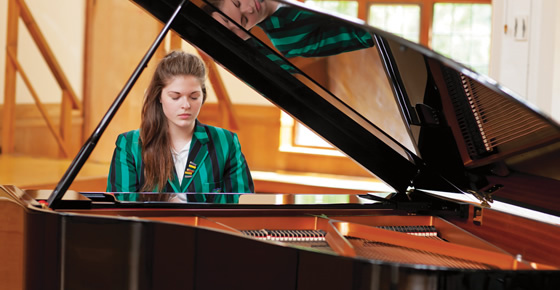 At Tormead, music plays a major part in the life of the school. Describing the significance of Music and Drama in today’s curriculum could be summed up in one word: expression. Music provides the ability to describe what words cannot. Drama allows students to create, perform and analyse the different ways we communicate ideas. Both disciplines teach the importance of clarity, the ability to inspire and the power of persuasion. At Tormead, music plays a major part in the life of the school. 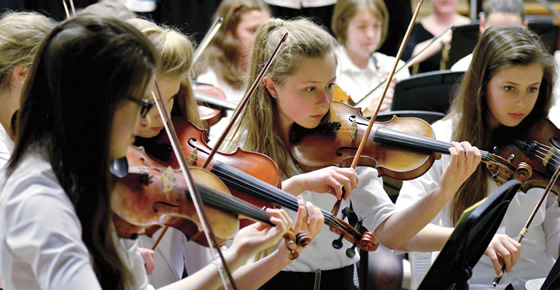 Girls are encouraged to play musical instruments, sing in our choirs and play in our different orchestras, as well as take part in various ensembles and chamber groups. Our highly acclaimed Jazz Band play locally as well as tour abroad. Music is timetabled throughout the school, including the option to study for GCSE and A Level. From their earliest days in the Junior School, girls are encouraged to sing in choirs and to learn to play at least one instrument. Around three quarter of girls in the Junior School and half of girls in the Senior School have individual instrumental lessons, and are encouraged to sit Board examinations up to Grade 8. Musical talent is both nurtured and welcomed: the school is proud to be able to award several Music Scholarships each year. As with Music, Drama is part of our core curriculum and may be studied at GCSE; Theatre Studies is a popular choice at A Level. Drama flourishes in extracurricular lessons and clubs: outside of lessons there are a number of public performances throughout the year, each aimed at different age groups. Joint productions are staged from time to time with boys from the Royal Grammar School. Recent productions have included A Midsummer Night’s Dream – to commemorate the 450th birthday of William Shakespeare, and Alice in Wonderland. Many girls also take external Drama exams in performance, with several girls each year attaining the coveted London Academy of Music and Dramatic Art gold medal. Tormead Drama alumni are currently studying at the Royal Academy of Dramatic Art and the Central School of Speech and Drama, as well as one studying film in Los Angeles. 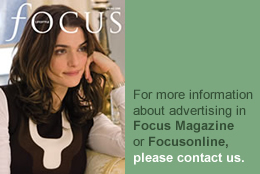 Others are now working as professional actors, arts journalists, producers or for theatrical agents.